Where to study: America, Asia or Europe is often the concern of young people when deciding to study in the country. Everybody wants to find a school of high quality education to experience the space and environment that they want. 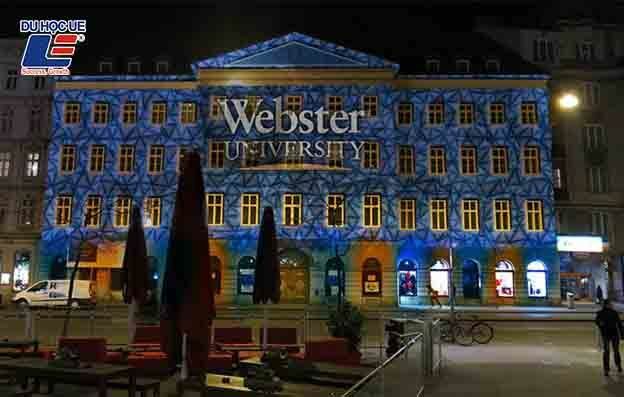 It can be said that Webster University can meet your wishes. With a proven track record in educational rankings, networked platforms in more than 30 countries around the world, and a flexible transfer policy, Webster is creating more and more learning opportunities for educational institutions. American students. Webster College, founded in 1915, is headquartered in St. Louis, MO. Louisville, Missouri, United States. With nearly 100 years of development, Webster has expanded over 100 facilities spanning the states of the United States and all continents around the globe. 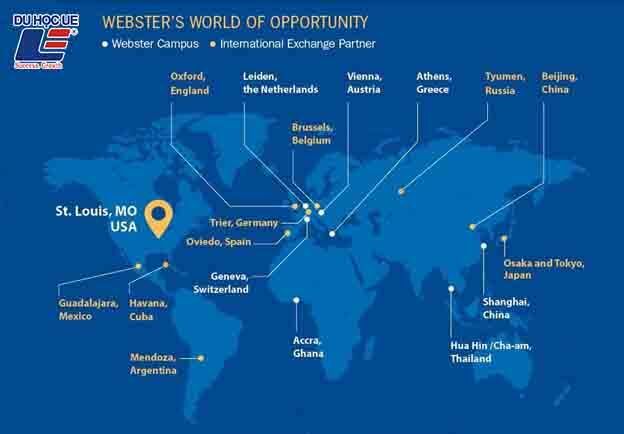 Webster University has more than 30 training facilities and 7 different campuses in the Netherlands, the United Kingdom, Switzerland, Japan, China, Thailand, ... Network Webster's cultural network is a gathering of about 150 nationalities. Webster University's degrees are administered by the Higher Learning Commission in the Midwestern United States, one of only six US accreditation bodies, administered and monitored by the Federal Ministry of Education throughout the United States. For six consecutive years, Webster University has been awarded the "America's Top Colleges" by Forbes. Webster also won the Transfer Honor Roll 2017 for schools with the most flexible transfer policy for students. The English Language Center is for those who do not have English at least 5.0. Can Vietnamese students transfer to Webster University? 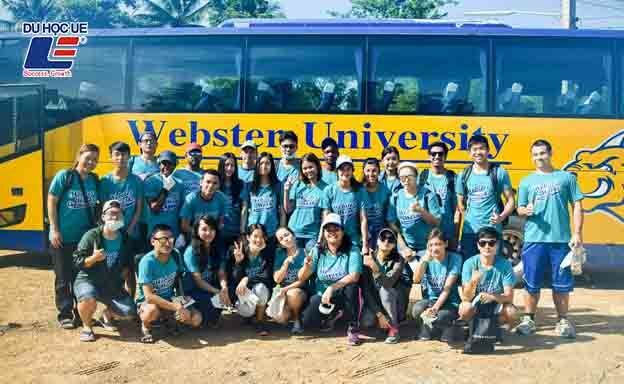 Webster allows students to transfer from the University in Vietnam to study in the United States. Once you become a student at the school, you will also be able to study in US states such as Missouri, California, Florida, Texas and Colorado, and in countries where your institution is located in Switzerland, the Netherlands. , Austria, Greece, England and more than 30 other countries. Students can transition from the second semester, as long as they complete two semesters at Webster and earn a 3.0 average. Cathy Ngo, Managing Director of Market Development for Global University System, said that universities are places not only for knowledge but also for exchanges. culture and social relationships, especially for international students. Being able to transfer from a Vietnamese university will save students at least 50% of the total cost of the program. The need is growing, so it's easy to understand why transition learning is so important. - Webster allows students to flexibly transition between countries and states in the system. Students who are enrolled at Vietnam University in the 2nd and 3rd years can also transfer to the next university for further study. - Students have the opportunity to experience the diversity of globalization when joining the Semester Abroad in Switzerland, the Netherlands, Austria, Greece, England & more than 30 other countries or in five different US states (California, Texas, Florida, Missouri ...). - Small class size 1:10 helps faculty to follow and support the best students. - Webster accepts multiple credit transfers from local universities or community colleges, students can continue their studies without having to repeat the course. - Transition increases the rate of entry of visa. - Save time and money (~ 700-800tr / year). - Worked in the US 1 year after graduation. - Scholarship of 20% of tuition fee when transferring in January 2018. How many subjects are transferred? - 1 A Level / IB / AP graduates: maximum 32 Credits (straight year 2). - Vietnamese students: up to 64 credits (right in year 3). - Vietnamese students in the year 3.4: maximum 90 credits (in the 4th year). Le Quang Liem is a Vietnamese student studying at Webster University. Le Quang Liem has achieved excellent academic achievements as well as participated in activities contributing to the school. You were the president of the Finance Club; Spice-Webster chess team has won and held the US State University All-Star Championship for four consecutive years from 2013 to 2017. In May 2017, Le Quang Liem graduated from Webster University, graduating with distinction for two majors in BA Finance & Management. "This year's Webster graduates come from 33 different countries, the youngest being 19, the oldest being 85," Liem said. This is also a very special feature in American universities in general, saying that knowledge is the most valuable asset that everyone wishes to achieve. That is a very real thing, not the dogmatic slogan that we often hear every day. Webster University has made all possible contributions to Integrity to fulfill academic excellence while pursuing the passion of chess with the dense schedule of an international player.